Say hello to two guys who call themselves A Great Big World. Don’t know this duo yet? Well, they’re about to get their big introduction to the mainstream via a cover on the television show Glee. You may remember that a little song called “We Are Young” made its debut to a large audience on the same television show in December 2011, and now fun. is practically a household name with several GRAMMY nominations and two million-selling singles. Will the same overnight success happen with this duo’s “This Is The New Year”? The year is still young. Here’s a little background on the group and the song that you may be adding on your next playlist. 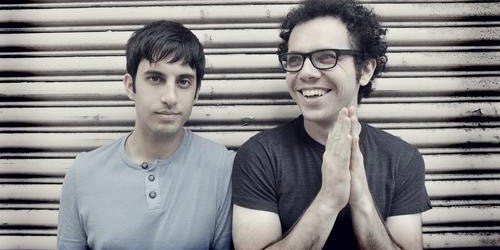 The duo of Ian Axel and Chad Vaccarino formed at New York University a few years back and they eventually formed a friendship while playing at the piano in the college’s practice spaces. Vaccarino found that Axel had a natural ability to sing and helped him to perfect his craft, going so far as to pay for his first professional vocal lesson. Axel started off as a solo artist, with Vaccarino managing him and writing his material. Axel put out “New Year” in a studio version to Adult Album Alternative, or AAA radio at this time last year, but the song never gained any traction on the airwaves and like a lot of songs, faded away, at least in the world of radio programmers. (The song dates back to at least 2008.) The song, however, provided them some online attention and the two set out on the road, opening for singer-songwriters like Five For Fighting and Ingrid Michaelson. It also got Axel’s material licensed to television shows like ABC’s Good Morning America and CBS’s The Amazing Race, among other well-known programs. Last summer, Axel’s solo act turned into both performers being credit as a duo, A Great Big World, and the two created and released a six-song EP funded on the popular site Kickstarter. Vaccarino states, “It’s optimistic, hopeful pop music. There are fewer songs about heartbreak and more about the meaning of life, but even the most painful of our songs are hopeful.” That hopefulness is definitely heard in “New Year”, as Axel and Vaccarino sing, “‘Cause in the end we have each other/And that’s at least one thing worth living for.” It’s a soaring piano-lead number that recalls the classic mid-80s Americana anthem mixed with a contemporary vocal and other melodic elements. It would certainly fit in with the current sound of adult contemporary radio and also has big crossover potential. The Glee version doesn’t really compare to it, but the group does a decent rendition of it. There’s a lot of expectations following the sudden exposure of the song on a major TV show, but I think the boys will be able to follow through and deliver one of this year’s first big breakout singles. Tune in and see the cast of Glee perform the song on the episode entitled “Naked”. It airs tonight at 9PM Eastern/8PM Central on FOX. Meanwhile, look for the original version on the charts in the next few weeks. By the way, if you get the chance, check out their whole EP, which is also available digitally. “I Really Want It” is another solid song from the effort, as well as “There Is The Answer”. Let’s hope that the answer is a good one following the show’s airing.